"Go Public" screening at Laemmle Dec.5 ... if they sell enough tickets! 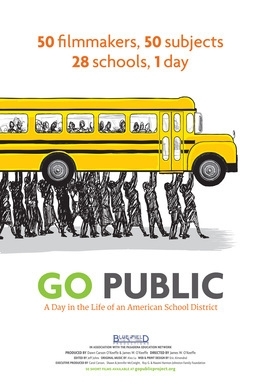 The Blair High School PTSA has just about a day left to sell enough tickets for a showing of "Go Public," the documentary about a day in the life of the Pasadena Unified School District. If you haven't seen it yet, now's your chance! Thru TUGG, the PTSA wants to screen "Go Public" on Dec. 5 at the Laemmle Playhouse in Pasadena, followed by a panel discussion. "Go Public" is the work of 50 filmmakers, tackling 50 subjects in 28 schools, all in a single day at the Pasadena Unified School District. Tickets are $10 each, and you can reserve your ticket by going here.